Every now and then my friends in Estonia say they want some soup. The craving for some good healthy broth is strong, especially in colder days. On the other hand there are people who always prefer solid food to liquid. This one is a favourite of many Estonians. I like soups that have pieces of the ingredients in them. Puréed cream soups are great as well but every now and then I want to be able eat rather than just swallow my soup. The dumpling soup is quite thick and serves as a full meal, especially at home with more than one helping. When I was growing up we never had to eat up what someone else put on your plate if we did not want to. Everyone took as much as they wanted and if on occasion what you had put on your plate was too much there was no obligation to eat up. Even if it meant that one mouthful was too many. I have always followed this principle. One’s stomach will tell when it is full, also a child’s. I guess for an adult the problem is not to want too much and recognise the moment of fullness. Soup is healthy, therefore two helpings are perfectly all right for a full meal. 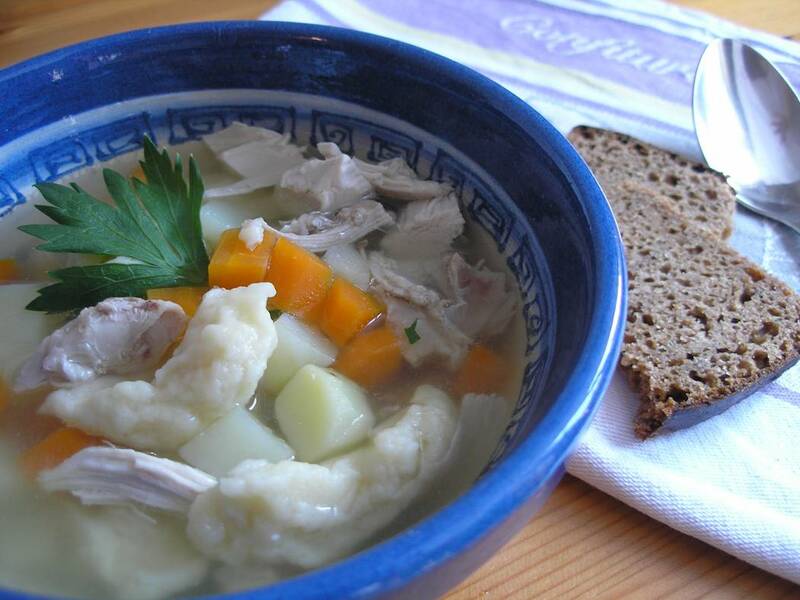 Chicken soup is well known for the healing properties against a cold. It certainly has helped me through some colds. Many cuisines make use of dumplings, German for example, being one of the closest influencers of the Estonian. The exact making varies, a mixture from old bread or flour, a combination with potato, gnocchis. Put the chicken in one piece into the pot with cold water enough to cover the chicken. Bring to boil and wait till the foam starts to form. Cook for a few minutes and keep removing the foam. It is important to remove the foam to get a clear stock. Throw away the water after the foam has been removed and start again with filling the pot with enough cold water to cover the chicken. Now add the cleaned onion, in one piece, as well as the carrot, celery leaves or root. Add 1 teaspoon of salt, the pepper and the bay leaves. Bring to boil at high temperature, then turn the heat down and simmer till the meat is totally soft and comes off the bones easily, 45-60 minutes. Turn the chicken once in a while and taste for salt. Some prefer to add the salt at the end, however I like the meat to take up some salt during cooking as later on it is difficult. As the chicken is cooking prepare the carrots and potatoes. Peel and dice them into 1 cm cubes. When the chicken is soft take it out on a plate and clean the meat off the bones discarding the skin. Remove the carrot, onion and celery from the stock.Put the shredded meat back into the pot. Take a ladleful of broth into a bowl and let it cool a bit. Add half the flour into the lukewarm broth. Mix thoroughly. Beat an egg and add to the mixture. Add more flour till the dough is quite thick (feels heavy and drops from a spoon slowly). No need to add salt if your broth had enough already. If you make the dumpling dough with milk instead of the broth, add some salt to the dough. Add the carrot and potato cubes into the stock and cook for 5-7 minutes. Take two teaspoons and start dropping the dumplings into the soup by wetting the spoons in the broth, taking a small quantity of dough onto one spoon and turning it around on the other to push down into the boiling soup. When the dumplings have come up to the surface the soup is ready. Garnish with chopped dill and/or parsley. Serve with dark rye bread, white bread or without any bread.